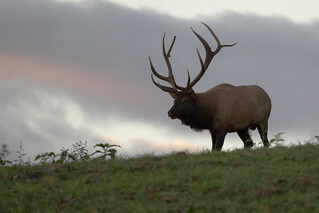 Elk Field Trip Coming Up at Audubon! Every Discovery Walk at Audubon includes a visit with Liberty, our non-releasable Bald Eagle. The children are always fascinated by her and full of questions. Once I’ve answered their questions, I ask one of my own: “How many of you have ever seen a Bald Eagle in the wild?” Several hands go up. It is now common to see Bald Eagles in our area; it was not when I was the age of these students. It took habitat restoration, conservation laws, and reintroduction to bring the populations back up to sustainable levels. With some groups, Liberty becomes the jumping off point for discussion of other species whose populations have fluctuated over the last few centuries. It’s hard to believe that male elk shed and regrow a new set of antlers every year! We talk about the fact that human activity is part of the cause for the fluctuations. For example, cutting some timber while leaving stands of forest creates “edge habitat” that is ideal for some species such as Eastern Bluebirds, though tough on species that need large expanses of uninterrupted forest, like Scarlet Tanagers. Cutting all the timber makes life tough on species that love edges and ideal for those that love wide open fields and meadows – like Brown-headed Cowbirds. Every action has its consequences. Next I might ask if any of the students have relatives or friends who hunt. Again, several hands go up. Do the hunters you know ever have any trouble finding deer? No! Most of the students have seen deer – often in their own backyards – even if they live in the city! I tell them there was a time when that was not the case. We talk about the kind of work done by conservation offices to make sure there will always be deer and other wildlife for our enjoyment and use, for observation and photography. We talk about the fact that sometimes, the populations become too large and may cause damage to our crops or forests and that hunting is one way to keep the populations at a level that is good for the overall ecosystem. 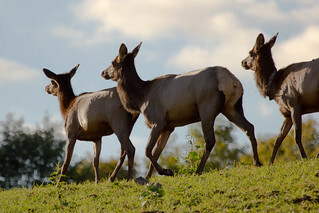 Male elk keep a “harem” during mating season. Here, two females with one bull. This history of Elk in Pennsylvania is another great example of how human activity led to the extirpation of the species – and how human activity brought Elk back to the area. An article on the Pennsylvania Game Commission website by wildlife education specialist Joe Kosack begins by noting that “Eastern Elk once ranged… from New York to central Georgia.” By the late 1870s the species was extirpated. The Pennsylvania Game Commission was created in 1895 “to replenish and provide protection to many of the state’s low wildlife populations.” In the beginning the commission concentrated on deer and turkey. In 1913, attention was turned to Elk and the first shipment of Yellowstone Elk was brought to Pennsylvania. Additional shipments from the west combined with strict hunting laws and limits have led to a healthy, sustainable population. Several females – one sporting a radio collar. Last year, I was lucky to attend Jamestown Audubon’s first field trip to Elk County to see the new Elk Visitor Center in Benezette. It is a trip I will never forget. First of all, the Visitor Center is beautiful and packed with lots of information about Elk and other wildlife of our region. The highlight, though was driving along the roads at dusk and coming upon a herd. We were close enough to hear the eerie “bugling” of the bull males as they called to females and announced their dominance over the other males. It was fascinating to watch the males herd their females, sometimes “stealing” from other groups. And you could notice different personalities among the males. Most seemed gruff and matter-of-fact, but one earned the name “The Gentleman” for the way he nuzzled the females in his group. We stayed watching the herd until it was almost too dark to see them before heading back to Audubon. Rick Rupprecht was our host last year. A former resident of Elk country in PA, he now lives and works in Chautauqua County and volunteers for Audubon. He’ll be leading the trip again this year on Wednesday, September 18, 2013. 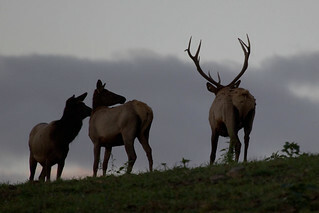 Because Elk are most active at dusk, participants will leave Audubon at noon and return at approximately 10:30pm. 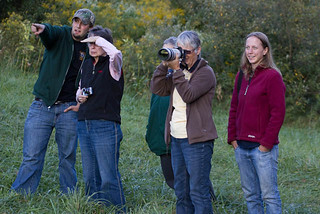 The cost to ride in the Audubon van is $35, or $30 if you are a Friend of the Nature Center. Reservations are required by September 13 and you can register either by phone or online. Space is limited so call promptly. Audubon Center & Sanctuary is located at 1600 Riverside Road in the town of Kiantone, one-quarter mile east of Route 62 between Jamestown, New York and Warren, Pennsylvania. For more information call (716) 569‑2345 or visit http://jamestownaudubon.org. The Center is open daily from 10:00am until 4:30pm except Sundays when we open at 1:00pm. Trails are currently open from 9:00am until 6:00pm to avoid peak mosquito activity. Please use insect repellent.